L'ORDRE: It's like I was watching this panel. Just today. Just earlier today, this short panel. It crossed over some of that subject. One of the guys on that panel was saying, you know, stop scapegoating refugees. It's a fascist belief or political view to demonize the refugees. But then on other hand, one could just as easily say that the demographic shift, those people coming in, is what's causing the fascist beliefs to proliferate because a lot of these groups you know like the BNP and the EDL. All these nasty groups in Britain at least, wouldn't have any traction with the population if there wasn't perceived to be a social problem in the first place that they were using to recruit people. At least that's my view. MIKE: Well I think there's a certain level of fear that's involved and this. In America the point where veterans aren't getting enough funding, why are people coming in as immigrants getting that? And it's a false narrative. There are two different separate departments that have two separate budgets that have nothing to do with the fact that veterans may not be getting money. There's no issue on immigrants coming in, it's two different parts of the government. MONY: OK wait, stop. I want to say something that needs to be said. I think the biggest fallacy is that you can separate military from immigrants. Because since World War Two. Soldiers have been marrying women abroad, bringing them home, and it's part of the culture. It's part of the culture, it's ingrained. A lot of mixed children from before the 80s, before the 70s, were born into the military. And people don't understand that they are spitting on the people who fight. So it's like the most insulting rhetoric they could tell the brats. Eventually I think it's going to come back around to the right wing who just doesn't seem to get it. L'ORDRE: You mean Donald Trump and the Donald Trump types? MONY: Yeah exactly they don't get it and people like Trump or basically home breakers, and very invested in penning in the population. It's much harder to get out of this country now than ever before. L'ORDRE: The way I see it. A lot of the reason why in the past in Britain and other E.U. countries integration was more successful than what it seems to be today is because of the numbers of people involved. You know, like when it's just a small quantity of people coming in resettling, people are alright with that because they think you know, it's just a gradual process of people what they want to be assimilated into the society. But what's happening now with the way people perceive it now, with the Syria refugee thing. They see it as being like D-Day. You know, it's just a massive quantity of people isn't it? Millions of people, all trying to be admitted all at once; They're all trying to be admitted into these countries all at once, millions of people? MONY: I feel very sad for them. I'm very sad for this, it's the most tragic thing I can possibly imagine. But I've been trying to rationalize this from an anthropological point of view and historically, mass migration went with famine and what have you. And yet we are at a point in the world where we simply can't accept the fact that people want to move around. We're so busy trying hold up the state and financial apparatus, people really feed into the imaginary boundaries and the flying a piece of cloth you know and getting way involved with it. And I'm like you, you guys need to settle down. 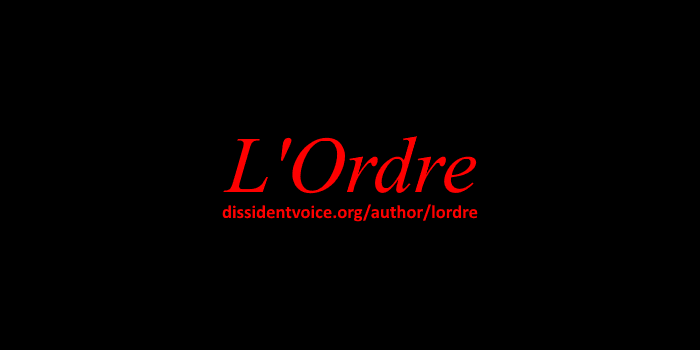 L'ORDRE: And it's not it's not so much that there's something wrong with these people, the refugees. They're no different than anybody else. It's just that any overpopulation or influx of millions of people into a region is going to destabilize that region. It doesn't really matter who they are they could be from any country or any part of the world and it would still have the same repercussions. So I'm of the view that it is kind of a crisis. 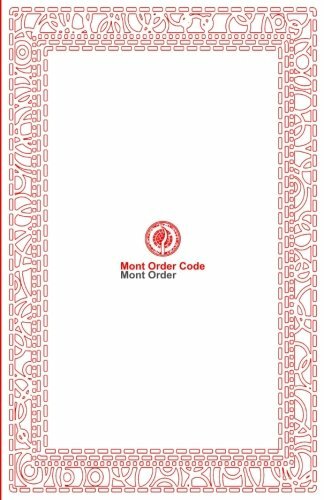 L'ORDRE: There are some people within the Mont Order who have circulated their views as well, who say that it isn't a crisis and the whole concept of it being a crisis is something that should be denied. I don't quite agree with that because if all these refugees - they could come from anywhere and it would be the same issue. A population issue. It is kind of like overpopulation. If the birth rate suddenly shot up and there were suddenly hundreds of millions of new people, that would cause a crisis as well because suddenly you don't have the housing space. L'ORDRE: Well they know what happens when you do that because Lebanon did exactly the same thing and with the wars that were in the area. The result was the war spilled over into their territory so they know that it's a bad idea. It's not a bad a bad idea because of the people, it's not that all these people are terrorists. It's an unstable situation and those people have problems that led to that war in the first place. And they kind of take those problems with them. In Syria where you've got different sects of people like the Kurds, different elements of the population, they all try and get out, to Germany or wherever it is that they're going to go. And then they carry on battling each other when they get there, into the country they moved to. They'll confront each other in demonstrations and things like that. If there were enough of them they'd probably start shooting at each other as well, but it's only because the number of them is quite limited at the moment that they wouldn't start shooting each other at this stage. MONY: What do you guys think could be done better in response to the crisis? L'ORDRE: Well I think the issue should be resolved in the region where the conflict is happening, in a way. So in. Within Syria. This is one of those things, isn't it? Where you can either be completely isolated from the events in which case you take no responsibility and no responsibility over any of the people. Or else you get heavily involved in which case you become responsible for all those people. In a way the West by being involved in Syria is responsible for a lot of these people. That's the way I see it. It's responsible for them fleeing that area because of the level of intervention there already is. You know like if you go back to the Iraq war and so on. I don't think there is a solution to be honest. I don't normally proclaim solutions. People always ask me, what's the answer? Sometimes there just isn't an answer. Sometimes you just have to let those events come to fruition. And we can pick up the pieces later after you know, whatever's happened. Maybe it will lead to a war but if it does lead to a war, it may just be inevitable. A bit pessimistic to think that but it might be true.